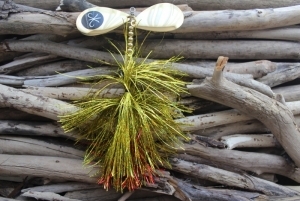 Kelly Kustom Musky Lures are made with the highest quality, premium components. Starting with a heavy 0.062" diameter Stainless Steel wire, the most durable Spinner shaft wire available in the fishing industry today. Two heavy duty clevises are used to attach the size #9 Magnum Spinner Blades to ensure free spinning action. 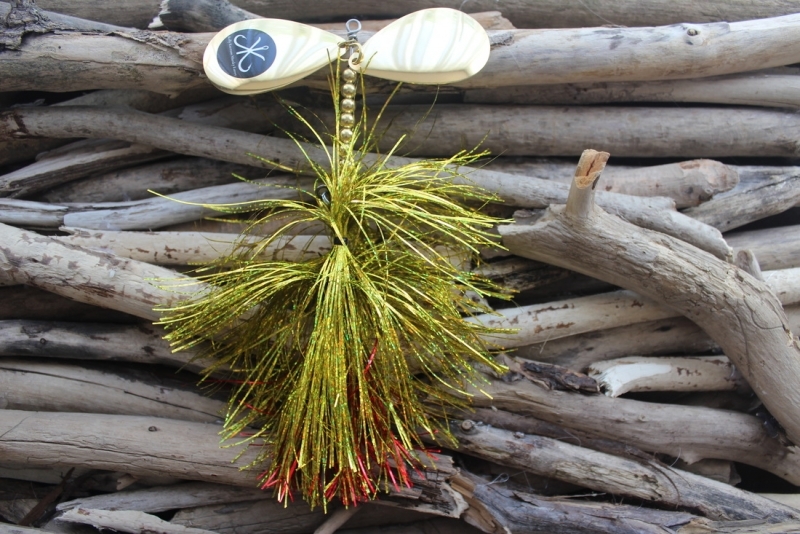 Gold and Nickel plated Metal beads are then used to finish off the top hardware section of the Lure. The Flashabou that is utilized for the skirt is the highest grade on the market. It is tied with a heavy tying thread, and glued using a hard setting epoxy. To finish it all off, Heavy Duty Zinc plated Steel split rings are used to attach the (2) *5/0 Eagle Claw 4X strong Treble hooks.